Our first family dog was a sweet black lab mix we named Flynn. She and her twin brother were abandoned, blocked in next to my co-worker’s fence with some trash cans. They were lucky enough to be found by very kind people, and my husband and I were fortunate to find out about the homeless puppies and to welcome an amazing family member into our lives. In the 15 years that followed, Flynn and I must have taken almost 3,500 walks in the neighborhood. She didn’t always have to “go” on our walks, but when she did, I simply used the grocery store bags that we seemed to have a constant supply of from our grocery trips. Over time, I switched to reusable grocery bags so started using the rolls of dog waste bags that fit nicely into a container that attached to Flynn’s leash. I never forgot a bag again, so this was very convenient. Flynn lived a nice long, happy life with us and our two boys. She passed over the rainbow bridge in 2016 and will live on forever in our hearts. We miss her every day. After some time, my family somehow convinced me to open our home to another dog, so we adopted a rescue puppy named Riley. She is now a year old and full of energy, so she needs to be walked every day. So, off we go. My recent focus on reducing my negative impact on the planet led me to question my almost daily use of plastic bags that go into a landfill. I’m not sure if it makes a difference what I put the waste into and toss into the trash. No matter what, that waste goes into the landfill. I cannot compost it in my backyard composter and the landfill is not the ideal environment for biodegradable materials to actually decompose. Still, finding a biodegradable option seems like the “greenish” approach to disposing of Riley’s waste, so I am trying some different solutions. So, I started by purchasing bags that the manufacturer claimed are made from “repurposed waste from the paper manufacturing industry” and made of a “strong material that is guaranteed to be leakproof.” The day I tried this product, I had the worst dog walk of my life. The bags ripped as I tried to separate them, as I tried to open them and as I picked up the waste. I kept adding bag after bag, hoping to contain the mess I needed to pick up and dispose of. Suffice it to say, I pretty much walked all the way home with dog doo all over my hand despite the 9 bags I used to try to contain it. I did call the company who made these gems to inform them of my dissatisfaction but I don’t want to trash-talk them here. Next, I tried bags made by Earth Rated (www.earthrated.com). 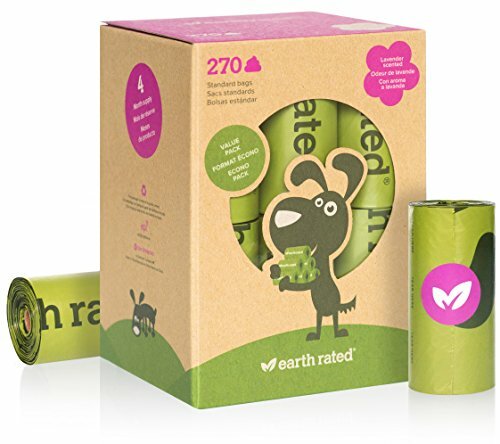 They are packaged in eco-friendly packaging and the roll core is made of cardboard, which is much better than the plastic ones I have used. The bags are still plastic, however, so my trash bin collects about 6 or 7 of these a week to go to the landfill. Not ideal, but definitely more “greenish” than I was being before. On a side note, I was pretty skeptical of the “lavender-scented for a pleasant pickup” because I get a little overwhelmed by strong flower smells. But now I don’t think I want to pick up a Riley mess without the scent. It really does make walking with the bag a (slightly) more pleasant experience. I am still searching to find the perfect solution to plastic-free walks with my puppy and will keep looking. What are you doing on your walks? Does it matter if the bag is biodegradable if you just put it into the landfill anyway? Have you come up with a solution that fits into a “greenish” lifestyle?